Austrian writer Schnitzler (1862-1931; Desire and Delusion: Three Novellas, 2003, etc.) pokes fun at literary pretensions and ambitions in this short novella nearly lost in the Nazi book burning campaign of 1933 and published in the U.S. for the first time. Eduard Saxberger, an elderly civil servant in Vienna, finds his poetry "rediscovered" by a group of young literary aspirants. Hailing him as Maestro and praising the single slim volume he published 30 years before, they welcome him to evening meetings at a local cafe. Saxberger, flattered, abandons the bourgeois acquaintances he now feels never really knew him in favor of young poets, a playwright, a frustrated novelist, a critic, and a "tragedienne" who flirts with him. 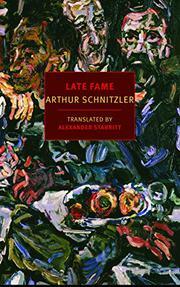 Schnitzler paints a deft, playful, well-informed picture of the Viennese literary scene. Rereading his own work, Saxberger wonders "how the world could have passed so unheedingly over verses such as these." Naturally, the undiscovered geniuses of the Enthusiasm Society are insufficiently appreciated by the public. They hold the other patrons of the cafe in contempt for being successful. As the poet Meier explains, "Talentless...is what we generally call those who sit at different tables from us." The group decides to organize a "recital" in order to showcase their talent, and Saxberger agrees to write a new work for the occasion. His attempt to fulfill the part of the "venerable poet" and achieve recognition gives the book its dramatic tension. The night of the recital unfolds with convincing, and inevitable, melancholy. Each character is prey to his or her own egotism and insecurity. Saxberger imagines an "intoxicating, deafening success." Instead, mingled with the polite applause, he hears a pitying remark that brings tears of enraged hurt to his eyes, which the others misinterpret as proof of an excess of feeling. In the end, Saxberger goes back to his old life with the sense that he is "returning from a short, troublesome journey to a home that he had never loved." In this elegant comedy edged with tragedy, an old poet's longing for the eponymous recognition, though mocked, is also understood.